Ages 6 through 17. Each of the reproducible worksheets in the downloadable edition of this book shows a bizarre newspaper headline and a creative illustration. Ask your students to create news articles for each headline. 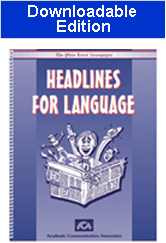 The humorous news articles will motivate your students to create original stories.